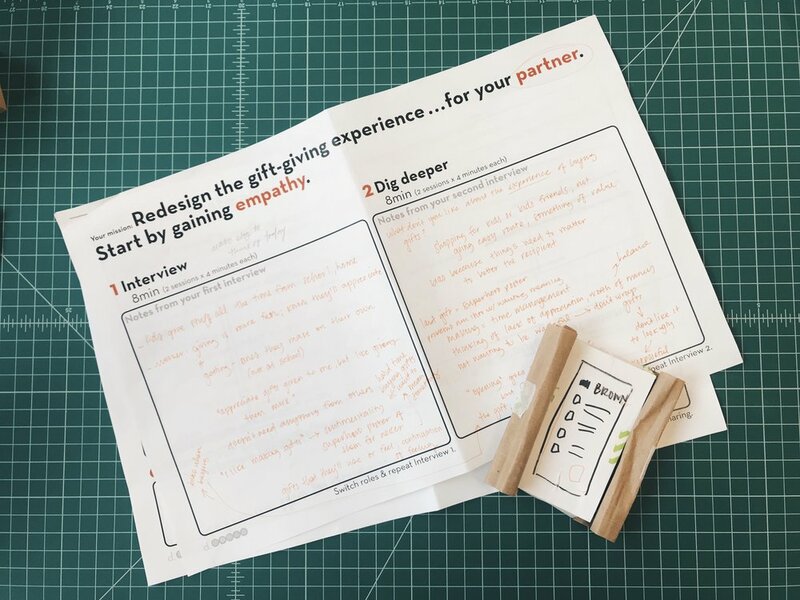 Thinking about the idea of co-creating and Human Centered Design, redesigning the gift-giving experience for a fellow classmate proved to be so critical in understanding these design philosophies. Getting to know another person and understand how they feel about something specific changes the game in terms of finding a solution for their needs. What challenged me was the beginning of the visualizations of what specifically would solve the problem. Jackie, my lovely peer, is a mother of two and is conscientious of her waste consumption. One of her issues involving the gift-giving process was not wanting to wrap gifts in paper to keep waste down. However, we talked about how part of the fun of a gift can definitely be the opening process, especially for her kids. So I wanted to come up with something to maintain the surprise of opening a gift but avoid the waste produced by tons of wrapping paper. I came up with a electronic gift tag that has multiple different wrapping paper designs loaded onto it, and upon choosing one and placing it on the gift, the tag releases a high tech fabric that wraps around the gift. This fabric has sensors that imitate opening sounds and sensations per the direction at which its being opened up. SUPER speculative. But she loved it. The idea of having one thing to do the job of multiple rolls of wrapping paper really appealed to her. With her feedback, we also discussed it having a lock feature to prevent others from unwrapping it beforehand, as well as a GPS in it to make sure it doesn't get lost, and if it does, to make sure she could find it. Thinking about these ideas very abstractly and speculatively was so freeing for me, especially in terms of actually prototyping the object and thinking about it in a more physical form.